Clinitest Tablets Poisoning is the accidental or intentional intake of Clinitest tablets. These tablets are not meant for consumption. What is Clinitest Tablets Poisoning? What are the Causes of Clinitest Tablets Poisoning? What are the Signs and Symptoms of Clinitest Tablets Poisoning? How is First Aid administered for Clinitest Tablets Poisoning? Who should administer First Aid for Clinitest Tablets Poisoning? 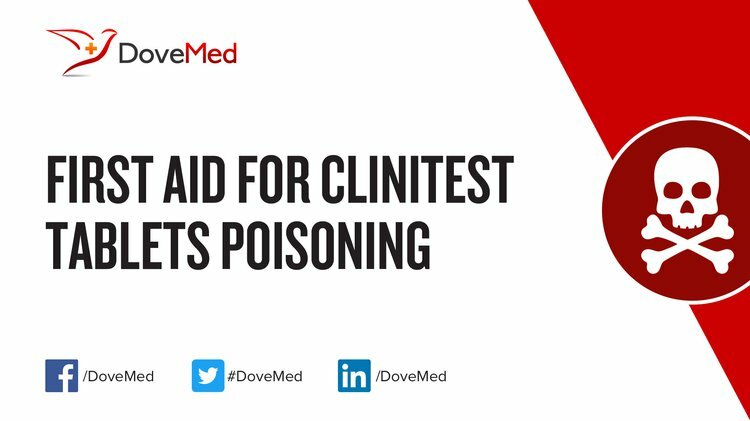 First aid for Clinitest Tablets Poisoning is administered by healthcare professionals. What is the Prognosis of Clinitest Tablets Poisoning? How can Clinitest Tablets Poisoning be Prevented? Chesney, R. W. (2013). The disappearance of diseases, conditions, and disorders of childhood. The Journal of pediatrics, 162(5), 903-905. Chemicals, M. H. Kills 1'000 Children Annually. Fiorino, K. N., & Mamula, P. (2011). Esophageal injuries. In Fundamentals of Pediatric Surgery (pp. 253-265). Springer New York. Sulieman, S. A. A. (2014). Ceflaxin Physical and chemical properties(Doctoral dissertation, Sudan University of Science and Technology). Ogbera, A. O., & Ekpebegh, C. (2014). Diabetes mellitus in Nigeria: The past, present and future. World journal of diabetes, 5(6), 905. Fogo, A., & Barakat, A. Y. (2012). The Urine and Urinary Sediment. Renal Disease in Children: Clinical Evaluation and Diagnosis, 31. Standard, U. S. P., & Boucherville, Q. C. Pr SANDOZ CEFPROZIL. Guslandi, M., & Braga, P. C. (Eds.). (2012). Drug-induced injury to the digestive system. Springer Science & Business Media.